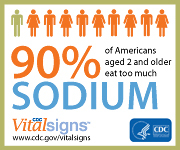 Did you know that approximately 90% of Americans aged 2 and older eat too much sodium? You might think that you are avoiding salt in your diet, but much of it comes from "hidden" sources. Breads, cheeses, pasta dishes, and chicken all might not taste very salty, but they are among the top 10 sources of salt in our diets. So much so that they are part of the 10 foods that make up roughly 44% of all the sodium in our diets. It’s important to know what you’re putting into your body and to know where these salty pitfalls lie. You can get the facts about the other foods in the top 10 along with tips for looking for lower sodium items in CDC’s Vital Signs: Where's the Sodium? fact sheet.